VANCOUVER — It is all about chemistry and communication. Oh, talent, too. Of course, talent. But two quality tennis players need more than skill to become a dominant doubles team. 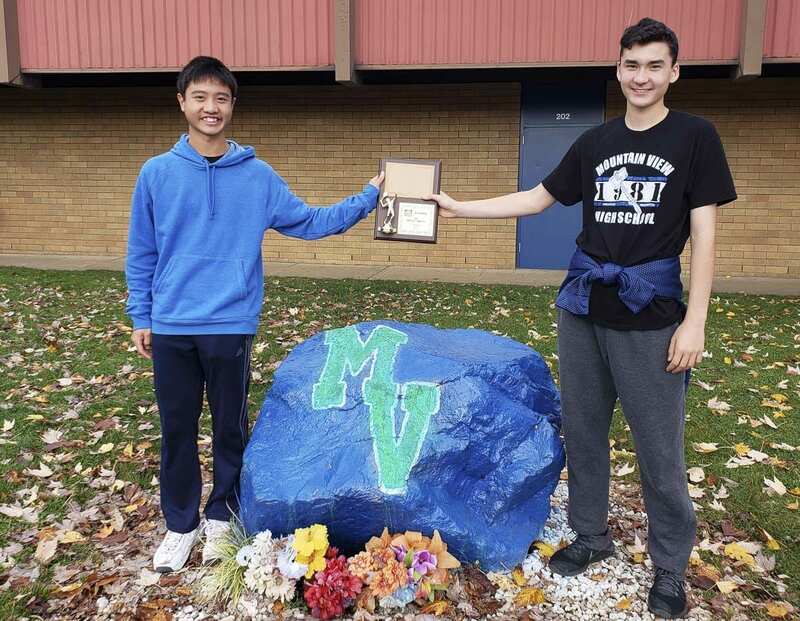 Which is why it was a pretty easy decision to team up Vincent Hsu and James Bertheau of Mountain View for the fall boys tennis season. Hsu is a sophomore, and Bertheau is a freshman so they did not play high school tennis together until now. But they have known each other since the two were in elementary school. They’ve played junior tennis for years, too. Now representing the Thunder, that friendship and talent combined to make quite an impression. Hsu and Bertheau won the Class 3A bi-district tournament last week, winning the championship match in perfect form, 6-0, 6-0. One of the reasons they clicked in the postseason is because they both were healthy at the same time. That did not happen for most of the regular season. For Bertheau, it was a long cold that limited his training. For Hsu, it was potentially more serious as he tried to respond from a wrist injury. Cleary, they are both feeling better. They qualified for the state tournament, which will be held in May, and with their success this fall, with how they dominated, one has to think of the expectations. Hsu already has state tournament experience. He and his older brother Edmund lost in the first round last spring, then won three in a row to earn an eighth-place trophy. “Better than how my brother and I did last year,” is the goal, Vincent Hsu said. Bertheau was an eighth-grader at the time, but he said he watched the state tournament. He knew one day he’d want to be there. So he has seen how much talent there is around the state. Still, he is confident he and Hsu can make some noise next spring. “Better than eighth place,” Bertheau said. The Hsu brothers finished third in bi-district last season to qualify for state. “It’s a pretty encouraging sign,” Vincent Hsu said. It was during this past summer that Hsu and Bertheau realized they could team up for the Thunder. Bertheau was known more for his singles play, but Hsu saw the potential. “I figured we could change James a little, get him to become a good doubles player,” Hsu said. For a few minutes, hours, or maybe even a couple of days, there was some doubt about that plan, though. Hsu crashed while riding his bicycle home from practice on Aug. 23, hurting his wrist. It was not a break, but the injury was severe enough that Hsu had to wear a temporary cast. “I saw the cast, and I just figured I was playing singles,” Bertheau said. Hsu continued to play, though. He could not do any power strokes, no full-strength forehands nor serves. In fact, it was only about a week before bi-district before he felt 100 percent. Bertheau, meanwhile, had to get over a nasty illness that lasted much longer than he figured it would. But again, once healthy, the Hsu-Bertheau team was unstoppable. Now they have months over the winter to train together in junior tennis and on their own before high school tennis resumes. “We both have the same drive of wanting to become better so we can both improve together,” Hsu said. That drive leads to the expectations … for this year and beyond for Vincent Hsu and James Bertheau.